Did you know that mineral oil, a petroleum-based product, is a key ingredient in many skin care products and cosmetics? It sure can surprise you to find out that your favorite skin cream is based on something they make gasoline out of! That sounds bad for your skin for sure, but is mineral oil really that bad? Let's first take a deeper look at what mineral oil really is. This product which is also called paraffin wax, liquid paraffin or petrolatum is a by-product of crude petroleum - it really is based on the same stuff as plastic and gasoline for your car! Technically it's a natural product, as crude oil is originally based on organic material, but it cannot be compared to truly natural ingredients such as plant oils and waxes, as it works so differently when used in skin care products than really natural plant-based ingredients. In skin care, mineral oil is used because it creates a kind of a barrier on the top of the skin to keep in the skin's own moisture. Mineral oil itself doesn't provide any moisture at all to your skin like plant-based oils do, it just covers the skin, retaining the skin's own moisture under a thin film of oil. That could be quite beneficial actually, if it didn't come with side effects like clogged pores and dryness of the skin, and even premature aging. Think about it: with mineral oil based skin care you are effectively smearing a thin foil of plastic on top of your skin. Do you think your skin can breathe under plastic any more than you can? That's right, it can't. Mineral oil does create a very effective barrier on the skin, but exactly because of that it interferes with the body's own mechanisms of moisturizing the skin as well as the skin's ability to eliminate toxins. That can lead to dry skin, clogged pores and even acne and premature signs of aging on the skin - the very problems people are trying to get rid of by using skin creams in the first place! Knowing all this, why do companies, even big ones with a great reputation and popular brands continue to use mineral oil as the main ingredient in their skin care products? Here's the harsh fact: because mineral oil is cheap - much cheaper than plant-based oils - and enables the products to have a long shelf life in the stores, as it doesn't go bad as quickly as natural oils and waxes tend to do. I don't know about you, but I think that's not a good trade. Sure, my cream won't go bad even after a year, but for that I only get dry skin and wrinkles? No thank you! I personally refuse to give my money to companies that sell their products at a high price but continue to use sub-standard ingredients such as mineral oil in them, especially when there are so many much better natural alternatives available. Instead of mineral oil serious natural skin care companies often choose to use plant-based oils and waxes like shea butter, avocado oil or babassu wax. These 100% natural ingredients won't clog your pores on your skin and will actually moisturize and nourish your skin, as they are completely natural and safe, yet effective. My tip to you is to make sure you read the labels of your skin care products and avoid mineral oil whenever you can! Instead, look for truly natural skin care products instead! 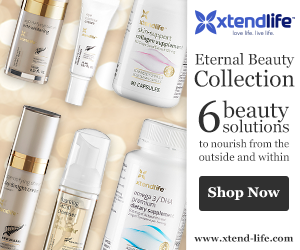 My favourite brand is the Xtend-Life's Natural Skin Care line, as they use only natural ingredients and make sure their products are pure enough to eat!